Local coke plant violates pollution regulations. Outraged citizens organize and speak up. The state's environmental protection arm steps in. The coke plant is forced to cease operations. Within a couple of months, air quality surrounding the site of the now-closed plant improves. A community breathes easier. It is. At least it has been, here in Erie. But in Tonawanda, New York, where Erie Coke Corporation's (ECC) sister site, Tonawanda Coke (TCC), used to operate, it's recent history. On July 20, 2018, The Buffalo News reported that the plant was ordered to shut down following a state Department of Environmental Conservation (DEC) inspection, which "found persistent and repeated violations of the plant's DEC permit." Complaints and pressure from residents who live near the now-closed TCC facility motivated the inspection. In a statement, DEC Commissioner Basil Seggos said, "In response to repeated violations and ongoing concerns about air pollution, I have demanded that Tonawanda Coke Corporation immediately cease and desist all operations associated with violations at this facility to prevent potential harm to its workers, surrounding community, and the environment and have commenced revocation of the facility's air permits." Tonawanda Coke's shutdown was completed by the end of last October. By December, The Buffalo News reported the DEC's findings that "lifetime cancer risk from environmental benzene exposure in neighborhoods around Tonawanda Coke is more than 10 times less now than a decade ago ... What's more, despite a small uptick in benzene releases this year compared to last year, the levels are 92 percent lower since the century-old River Road plant closed in mid-October." 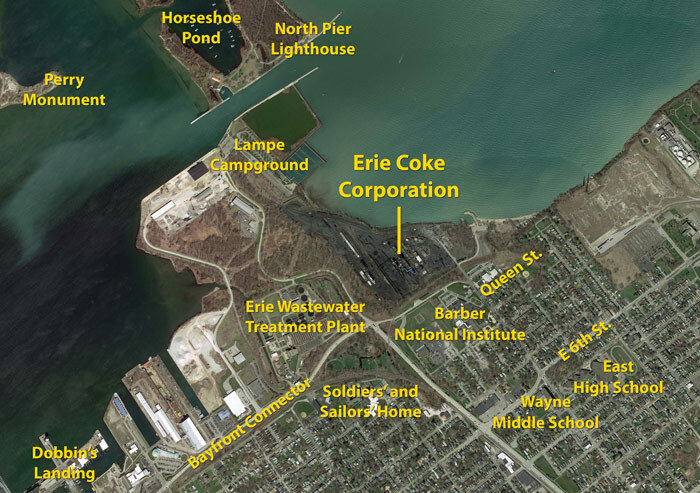 A couple of years ago, we published a piece that laid out some of the parallels between Tonawanda Coke and Erie Coke, from ownership to management to violations. Clearly, a lot has changed in Tonawanda since then. But though Erie Coke still operates at the foot of East Ave., a lot has changed here, too. One example is the formation of the activist group Hold Erie Coke Accountable (HECA), self-defined as "a non-partisan citizen and community initiative, inspired by the civic resolve that Erie's rise as a leading 21st-century city of choice rides on high quality of life and a healthy environment, requiring that Erie Coke cease violating its air quality emissions permit." HECA's website and Facebook page serve to keep residents informed, and also to provide a forum for sharing concerns and reporting incidents. Most urgently, they encourage the community to report to the Pennsylvania Department of Environmental Protection (DEP) anything "out of the ordinary" coming from ECC, such as colored plumes or odors that are sulfuric or acidic (please see sidebar for contact info). Citizen reports are especially crucial given the egregious lack of air quality monitors in the area surrounding Erie Coke. The nearest monitor is a mile-and-a-half away. Currently, there's no way of knowing for sure what residents who live close to the ECC plant — or those at the Barber National Institute, or the Soldiers' and Sailors' Home — are breathing in daily. Multiple residents of Our West Bayfront, a neighborhood at the forefront of revitalizing Erie, have reported incidents of putrid odors emanating from the direction of Erie Coke, as have people who live throughout the city and to the east, downwind of the plant. These complaints do not fall on deaf ears; rather, they help our DEP with their ongoing investigation. Nonetheless, New York's DEC has comparatively been more active, including ensuring that $11.4 million collected from fines paid by TCC will help fund a substantial public health assessment study now underway. In contrast, it's unclear where fines levied on Erie Coke have gone, though HECA has repeatedly requested this information from the DEP. HECA operates under the leadership of Erie Benedictine Sister Pat Lupo and citizen scientist Dr. Mike Campbell. Both have advocated for environmental justice for years. Both have felt the frustration of corporations permitted to break laws designed to protect public health. So what makes them think things are different this time? Lupo feels that "Now is the time to push for change because of the issues that are rising to the surface," including the upcoming renewal of Erie Coke's Title V Operating Permit, and the DEP's corresponding public hearing. The DEP is currently reviewing ECC's renewal applications for its Title V Permit and National Pollutant Discharge Elimination System (NPDES) Permit for [an] Individual Permit to Discharge Industrial Wastewater, both of which are required every five years. After a technical review of both renewal applications, the DEP will schedule a public hearing, "where members of the public will be invited to provide formal testimony and comments on the draft permits," according to the DEP website. HECA has requested that the two permits be addressed in two separate hearings, given each's particular complexities. And since Erie Coke has been back in the news lately, public alarm is ramping up. On Feb. 4, the DEP "issued an administrative order to Erie Coke to address ongoing violations of the Pennsylvania Air Pollution Control Act at Erie Coke's coke production facility in the City of Erie," according to the DEP website, where a copy of that order is available. "This has engaged the media and strengthened HECA's position," Lupo says. "Experts and citizens alike are contacting HECA to lend support." Some of that support comes from Group Against Smog and Pollution (GASP), an organization founded in 1969 that "works to improve air quality to protect human, environmental, and economic health in Southwestern Pennsylvania." GASP has had sustained involvement in demanding that other coke plants comply with emissions regulations, including Clairton Coke Works and Shenango Coke Works in Allegheny County. On their website, GASP explains the DEP's recent administrative order, which "lists 59 regulatory violations Erie Coke committed between June 3, 2017 and Oct. 11, 2018. These violations included exceedances of opacity limits for emissions from the coke ovens, illegally bypassing required hydrogen sulfide absorption equipment, and violating quarterly continuous monitoring standards, among others." Meanwhile, Erie Coke is located in what the DEP defines an Environmental Justice Zone: "any census tract where 20 percent or more individuals live in poverty, and/or 30 percent or more of the population is minority." As such, the DEP's Enhanced Public Participation Policy "was created to ensure that [Environmental Justice] communities have the opportunity to participate and be involved in a meaningful manner throughout the permitting process when companies propose permitted facilities in their neighborhood or when existing facilities expand their operations." In other words, the DEP is especially tuned in to what Erie has to say. Campbell is encouraged by the DEP's awareness that this is an environmental justice issue, adding that "Pennsylvania shouldn't want to be any more lenient with this polluter than New York state was." Erie isn't the only Pennsylvania community where a coke plant has violated the law. 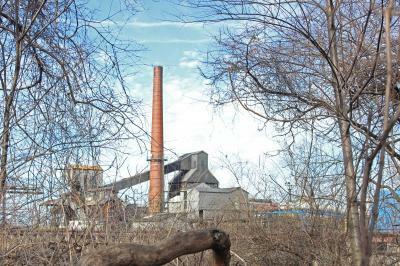 Shenango Coke Works closed in January 2016. According to GASP, the plant had violated air pollution compliance laws on 332 of the 432 days it was monitored. But despite facing multiple environmental lawsuits and fines, a downturn in the steel industry is widely blamed for the closure. About 20 miles south of Pittsburgh, U.S. Steel's Clairton Coke Works is under increased scrutiny, especially following a Dec. 24 fire at the facility that damaged pollution control equipment. In a January 1 report on NPR's Morning Edition, reporter Reid Frazier explained that Clairton Coke Works, "remains North America's largest producer of coke … According to the EPA, the air here is some of the worst in the country." "There are around 20 coke plants in the U.S.," Frazier continued. "And many have violated clean air laws. In Clairton, it's been a problem for decades. Regulators reached major settlements with U.S. Steel over the plant's pollution violations in 1979, 1993, 2007, 2008, 2014 and 2016. But after every agreement, the plant would again fail to meet requirements." Erie Coke and Erie are at a turning point. The city has set aside clinical pessimism and a siloed, tribal approach to its challenges and opportunities. Stakeholders are acting with intention to create a new economy and foster inclusion by embracing diversity. It looks to become a city of choice, pedestrian-friendly and bikeable with a downtown core rich in activities and attractive housing. Erie Coke offers badly needed employment opportunities. But not at any cost. [HECA] observes rightly that the uncertainty posed by Erie Coke's uneven compliance record does not sync with the city Erie looks to become. Our tolerance of Erie Coke's flagrant disregard for the law and public health sends a detrimental message to investors, developers, residents and tourists: that we lack self-respect, and that we don't genuinely care for our city. If we appear reluctant to protect ourselves and our neighbors, how are we going to invite others to call Erie home? In a strategic report titled Quality of Place & the New Economy: Positioning Pittsburgh to Compete, Richard Florida of Carnegie Mellon University writes that "In this era, economic success depends on a region's ability to attract and retain a young, highly educated workforce." The report is geared toward Pittsburgh, but certainly applies to Erie. Florida asserts that "'Quality of Place' — particularly the variety and accessibility of natural, recreational, and lifestyle amenities — is vital in attracting talent and thus in supporting a broad range of leading-edge high technology firms and industries." He also argues that "Environment — particularly air and water quality — matters. The new economy dramatically transforms the role of the environment and natural resources. What was once viewed as raw material and a sink for waste disposal must now be seen as an essential component of the total 'Quality of Place' package required to attract talent and generate economic growth." Even the most cynical Erieite could scarcely deny that we're creating a new narrative for our city. We're recognizing that to actualize the Erie we want to live in, we have to tell the story of who we are to others who'll want to invest and live here. Mike Campbell wants us to "imagine what awesome opportunities for invigorated tourism and development would be possible on our city's lower east side if the air down there was fresh and clean all the time." Sister Pat Lupo encourages everyone to go to HECA's website and Facebook page to become informed and engaged. "This is our city and if we want to improve our air, water and the quality of life in our community, then we must all get involved," she says. "We owe it to our neighbors to be concerned about their health and the health of our environment." note: this piece has been revised as it appeared originally, which had incorrectly noted the location of air monitors.